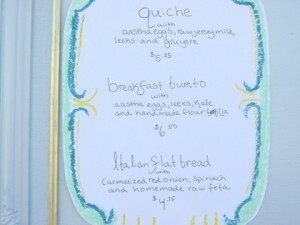 Check out the menu, Jason and Dahlia also have a great breakfast burrito filled with farmers market produce. 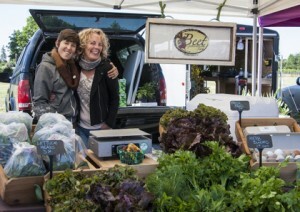 The Original Certified Santa Rosa Market; farmers, ranchers and artisans are so photogenic or maybe we just have a great photographers. 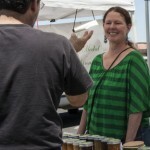 The market is lucky to have professional photographers Elinor and Tom Burnside as customers and supporters of the market. They took these wonderful pictures on the Saturday, May 26th. To see all of each photo click on the thumbnail. News Alert! Mark your calendars: Closing early 6/2 at 11:00. 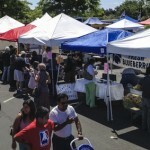 The Saturday June 16th market will be held Sunday June 17th, the market is part of a special event at our new location Luther Burbank Center for the Arts. Next is our own House Warming Party Saturday June 30th, 2012. Beerfest is a festive microbrew and food tasting extravaganza with more than 40 of Northern California’s best microbreweries and gourmet food purveyors. Ticket includes all food and beverage tasting, plus a souvenir glass! 21 and over only. Please note that pouring stops at 4:30 p.m. Tickets can be purchased online at www.f2f.org or wellsfargocenterarts.org, and in person at the Luther Burbank Center for the Arts Box Office or at Face to Face (873 Second Street, Santa Rosa, 95404). 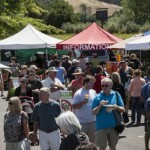 Beerfest benefits Face to Face | Sonoma County AIDS Network. Face to Face works to improve the lives of people affected by HIV and to eliminate the number of new infections in Sonoma County. 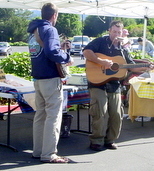 Learn more about the agency and the event online at www.f2f.org. 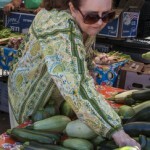 The Wednesday market attracts great chefs because freshness counts and much of the same great fruits and vegetables are available without the crowds. 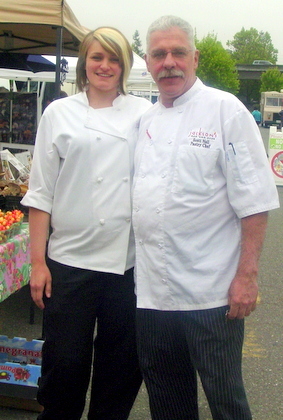 Here are Scott Noll, pastry chef at Jackson’s Bar and Oven and rising star baker Kima Lovold Noll described her as “amazing.” We saw Chef Noll shopping with another young colleague at the Saturday market using the moment as a teaching exercise. We think he is amazing. 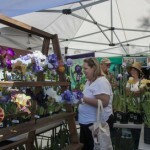 Last year Diane Peterson of the Press Democrat shared chefs’ recipes for spring fruit and berries. One of the featured chefs is Scott Noll. Min-Hee Hill Garden,The Dreamcatcher Ranch (featuring lamb this week), Redel’s Roasted Almonds, Willow Designs, Full Circle Bakery, Bohemian Well Being Town -Mushrooms, Ridgeview Farm, Parsons Homegrown, Amstrong Valley Farm, Desantis Fruit, Hector’s Honey, Carson’s Catch,The Garden Wild, Waterhorse Ridge Jams, Country Rhodes, Mi Fiesta, Lata’s Indian Cuisine,EGB fruit stone fruit peaches and apricots this week and Vicky Kemp designs. 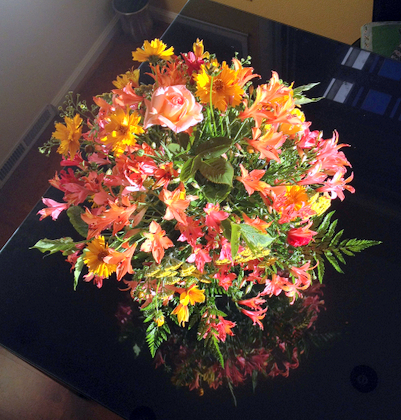 Tom Burnside photographed A Bouquet of Spring from Kay’s Bokays. 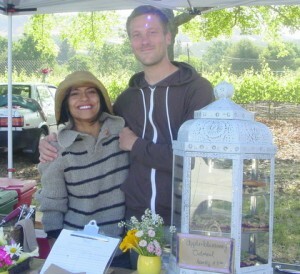 Kay and Charles Stark were original vendors at the Santa Rosa Original Certified Farmers Market and still grow all the flowers for their Bokays on their land in Santa Rosa. Thank you Tom for sharing your photograph . 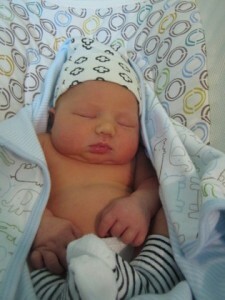 Congratulations to Ariel and Jeff and welcome Marley Mae. These are committed farm folks . They included their current crops with the birth announcement! What a week we’ve had! Jeff and I are so excited to hail the arrival of our new baby girl, Marley Mae Russell! She burst into the world last Wednesday and is settling nicely into her role as Farm Princess (no work required!). I can say with certainty that she is the BEST thing we’ve ever grown and we can’t wait for her to meet everyone once she’s big enough to start working the Farmers’ Market with Mom and Dad. 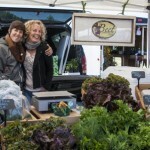 Even though this week has been nuts, the Farm is still moving along and we have a lot of great product for tomorrow’s Santa Rosa Original Farmers’ Market at the Well’s Fargo Center. This is definitely the week for purple and romanesco cauliflower. In my opinion, Romanesco Cauliflower is one of the tastiest veggies out there and it’s nearly impossible to find it anywhere other than fresh picked from a local farm. And purple cauliflower, well, it speaks for itself. Anything that colorful has to be extra good for you. Along with the cauliflower, we’ll have more of our fantastic broccoli (heads and sideshoots), fava beans, Italian parsley, and the season’s first atomic Rainbow Chard and Dino Kale. Hopefully you can make it to the Well’s Fargo Center and say hi to a happy, yet sleep deprived Jeff. 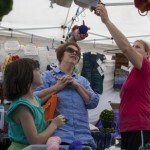 Hope to see you at the Market! Making a secret sauce for the grill? 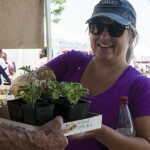 Get a head start..
Meet the flavors of The Hue de Larque Farm If you haven’t stopped by this booth you are missing out on ingredients that will inspire you. Here is their current list of flavored balsamic vinegars good on their own but they could be the start of something great. And if someone else is doing the cooking – it makes a gift that will get you invited back..
White Balsamic w/ Apricot Combining the sweet flavor of ripe summer apricots with this rich, full-bodied balsamic vinegar creates an exceptional taste experience. White Balsamic Vinegar w/ Peaches The fresh and sweet taste of ripe peaches blends in a harmonious manner with this world-class balsamic vinegar. The sweet flavors of these two will leave you wanting to use it on everything! White Balsamic w/ Green Apple – VSOPThe perfect blend of sweet and sour apple blended with our renown 25 Star Balsamic Vinegar of Modena. This is a treat that you won’t soon forget! Perfect as a featured offering during the Spring and Summer months, and even well into the fall! Dark Balsamic Vinegar w/ Tangerine The orange’s sweeter counterpart, the tangerine, makes an incredible addition to our balsamic vinegar line up. The citrus flavors take a secondary approach to it’s sweet and refreshing character. Dark Balsamic Vinegar w/ Pomegranate Sweet and refreshing pomegranate flavors add amazing depth and flavor to our high-quality aged balsamic vinegar. 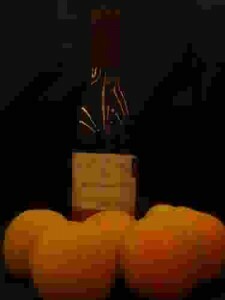 A real treat for the senses, with it’s intense, sweet and tart qualities. Dark Balsamic w/ Fig A fabulous introduction to the world of premium flavored balsamics. The nutty, semi-sweet flavor of fresh fig enhances and deepens this naturally intense balsamic vinegar. Got guests for Memorial Day Weekend? 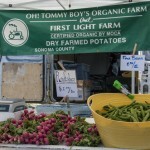 The best place to take them for a great taste of Sonoma is the Santa Rosa Original Certified Farmers Market. Start off with a farmers market breakfast – so many wonderful choices. Mateo Grandos is famous for buying everything for his breakfasts at the market. This weekend Mateo himself will be cooking. Rosso Pizza makes a breakfast piadini…local sausage and eggs and potatoes in a thin pizza crust. Thinking about something later in the weekend you can take home some of Rosso’s pizza dough and handmade mozzerella and dyi. Jennie’s Oysters from Drakes Bay BBQ and raw — and so good! 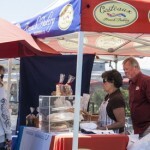 Check out her famous chowder too! Thinking about all those meals to prepare over the weekend – we’ve got take out for you. Mi Fiesta ..the name says it all. It’s party on a plate. Chips, salsas, beans, rice, tortillas, enchiladas, tamales, chile rellenos. It’s worth to stop and see what Mi Fiesta this week. They have the traditional salsas but they always have something fun and seasonal. And don’t forget Lata’s Indian Cuisine. The best Indian food in Northern California. 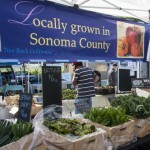 Lata uses traditional Indian recipes but Sonoma grown produce. Her curries are always seasonal. Manager’s Pick stone fruit – cherries and apricots are at the height of their season…It was not a good year for apricots because of weather so anyone who is an apricot lover should get them now. Early peaches are quite good. Nectarines are even better. Usually peaches don’t get really sweet till it gets into June but they are sweet right now. Dry Creek Peach and EGB have peaches! They are always happy to give you a taste. 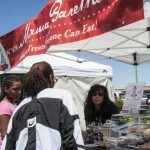 Italian style goat cheeses are available from Two Rock cheese. Don has a variety of cheeses – some you would not expect — it is always worth a stop. If he has some brie – grab it. Two Rock Valley Goat Cheese is one of the county’s newest kids on the block, pun intended. This little creamery is so fresh that it doesn’t even have a Web site. “Somebody gave my wife some goats, and I said to her ‘Bonnie, we can’t drink two gallons of milk a day so let’s make cheese,’” says Don DeBernardi, owner and cheesemaker. DeBernardi’s delectable, aged goat cheese is known throughout the county as Two Rock Valley Goat Cheese, but his new labels call it Canaa, after the Swiss town where his relatives taught him cheesemaking. 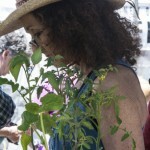 Visits to the Petaluma farm are free, just call DeBernardi (707.762.6182). 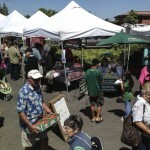 Thinking about grilling – we are the best butcher shop in Sonoma County. But we also have great choices for vegetarians, vegans and seafood lovers. There are vegetables for everyone — no matter what they like. 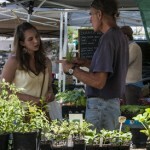 Nothing grills better than mushrooms – Check out the great selection at Bohemian Well-Being Town. Mr. Kim is a great cook and is happy to share some recipes with you. 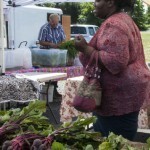 Foggy River Farm offers a variety of Asian vegetables including baby bok choy. Armstrong Valley Farm has some great looking squash perfect for stuffing and grilling. Carson’s Catch Wild salmon and wild halibut from Alaska. Flash frozen right on the boat – the freshest, best tasting fish you will find anywhere. Good for you and the environment too. 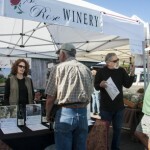 And while you are in the neighborhood check out Old World Winery on River Road. They do everything old-school, including stomping the grapes. The wines are delicious. They are growing small blocks of grapes not grown any place else. 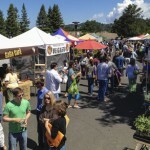 The best butcher shop in Sonoma County is the Saturday morning market at Luther Burbank Center for the Arts. 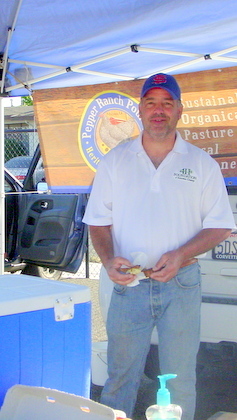 Before 2009, it was rare to find a small meat producer selling at farmers market. 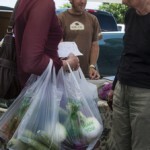 Now the market has the best choices in the county. 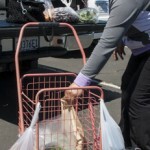 Meat vendors are not certified by a county agriculture Department but Santa Rosa Farmers Market requires its ranchers to produce the meat they sell. It’s the beginning of Summer and lots of grilling will be going on. Our ranchers are happy to get special orders. 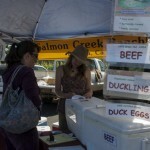 Black Sheep Farm, Potter Valley: Pork, lard (occasionally), beef. 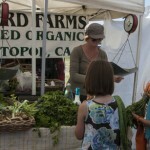 Owen Family Farm, Hopland: Lamb, goat, veal, beef. Williams Ranches, Sebastopol: Lamb, goat. And not a rancher but a great chef, Franco’s One World Sausage Company. all kinds of sausages and pancetta too. When we say the best, we aren’t just bragging! Here’s what food critic Heather Irwin has to say about Pepper Ranch Poultry. I hate that. Except that I’m about to do it to you.